Join the revolutionary world of 3D printing! 3D printing is an art and a science. Unleash creativity and technical skill. Simply one of the most affordable and advanced 3D printers on the market. Welcome to the World of Imaginator 3D! If you can imagine it, you can build it! 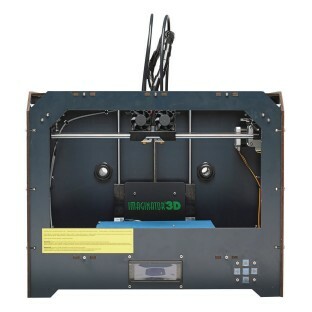 It will take a bit of practice but before long you will be perfecting your builds with this Dual extruder 3D printer with heated build plate. An SD Card (2GB) and a PLA plastic spool come with the 3D printer so you can start building right away! Quick start-up guide and unpacking guide included. Build surface is 7" x 7" x 9". PLA and ABS plastic can be used with this machine.